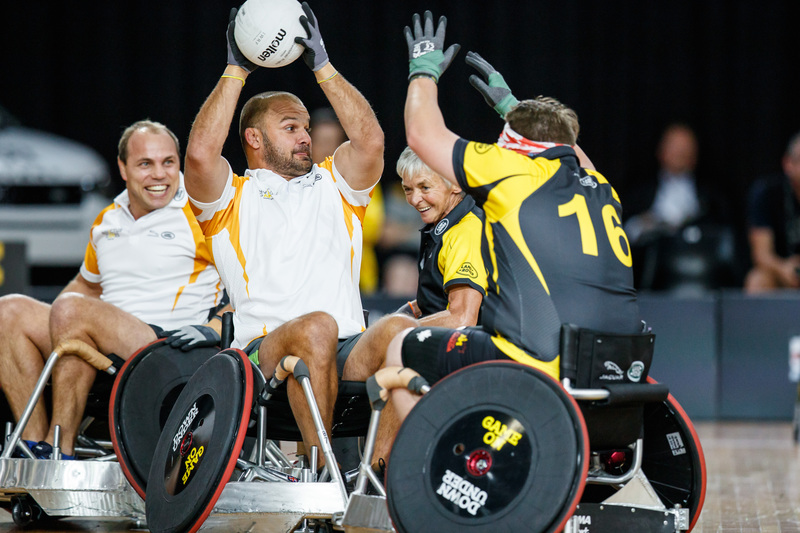 Sydney, Australia, 26 October 2018 – Rugby legends threw their support behind Invictus Games Sydney 2018 as they took to the court in the Jaguar Land Rover wheelchair rugby exhibition match to celebrate the healing power of sport. Former Wallaby Rob Horne and legendary England winger Jason Robinson went head-to head as managers of the two sides, with Robinson's Invictus Games Sydney 2018 team coming out on top 16-13. The game also featured rugby union stars Phil Waugh, Dean Mumm, Adam Freier, Stephen Hoiles and Cam Shepherd, who took on a Rest of the World team selected from various nations competing at the Invictus Games Sydney 2018 presented by Jaguar Land Rover. Rob Horne, whose professional rugby career was ended after suffering serious nerve damage to his right arm, said: "It's a real honour to be here at the Invictus Games Sydney 2018 and meet so many inspirational men and women, who are showing how sport can aid their long-term recovery from illness or injury. "As an Australian, I'm so proud to see how these Games have been embraced by the people of Sydney, and it's brilliant to see the rugby community get behind them too with this Jaguar Land Rover exhibition match." Jason Robinson, a Land Rover ambassador, said: "I played alongside HRH The Duke of Sussex in the Jaguar Land Rover wheelchair rugby exhibition match at the very first Invictus Games in London in 2014, and it is fantastic to see how this event has gone from strength to strength since. "I have brought all my family out to Sydney this week, as I wanted them to experience what the Invictus Games are about and be inspired by the men and women here and what they are achieving. It's an honour to be part of it and witness the competitors' determination." 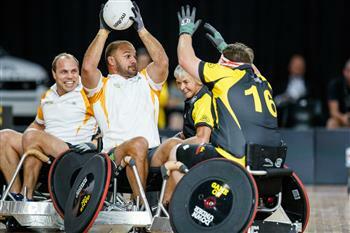 The exhibition match, presented by Jaguar Land Rover, took place during the Invictus Games Sydney 2018 wheelchair rugby competition at the Quaycentre in Sydney Olympic Park. Australia took gold, beating the United Kingdom in the gold medal match and team USA earlier won the bronze medal match. Jaguar Land Rover is the Presenting Partner of the Invictus Games and has supported the Games since its inception. One of the many motivators for the partnership is Jaguar Land Rover's ambition to find innovative ways to enhance the employment prospects of ex-Service personnel moving into civilian life, including those who are wounded, injured or sick. Jaguar Land Rover is committed to providing skilled career opportunities to those leaving the armed forces and has employed almost 1,000 ex-Service personnel globally since 2014 – the year of the first Invictus Games. The company has proudly supported five employees directly on their Invictus Games journey, with a further three employees competing in Sydney. Jaguar Land Rover is using this year's Invictus Games to lead and inform the debate on future mobility, and how its future technology could help people's lives. This has included the chance for Invictus Games competitors to test Jaguar Land Rover's autonomous technology ahead of the event, and provide feedback about how it could help their lives. Jaguar Land Rover is the UK's largest automotive manufacturer, built around two iconic British car brands: Land Rover, the world's leading manufacturer of premium all-wheel-drive vehicles; and Jaguar, one of the world's premier luxury sports saloon and sports car marques. We employ more than 44,000 people globally and support around 260,000 more through our retailer network, suppliers and local businesses. Manufacturing is centred in the UK, with additional plants in China, Brazil, Austria and Slovakia. Our innovation is continuous: we will spend in the region of £4.5 billion this year on new product creation and capital expenditure. Rugby legends threw their support behind Invictus Games Sydney 2018 as they took to the court in the Jaguar Land Rover wheelchair rugby exhibition match to celebrate the healing power of sport.